The cold hand of demographics cannot be denied. 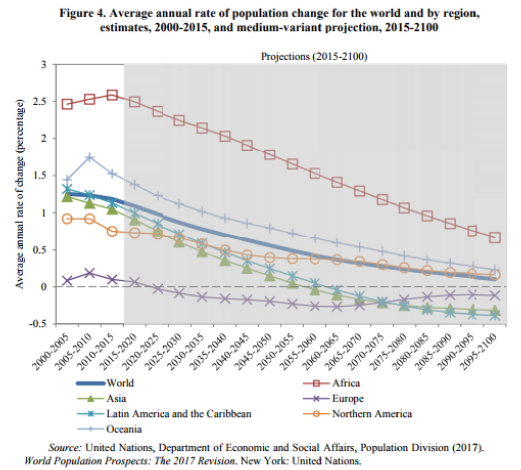 Global population will begin to decline soon after 2100. The real question is whether an implosion can be avoided, economic decline can be held at bay and that an irreversible death spiral can be avoided. For over 100 years it has been the threat of unsustainable population explosion which has exercised the minds of governments and policy makers. There are still many people who have spent their lives confronting this problem and cannot adjust to the new reality. This reality is that fertility rate is declining across the world. There is nowhere in the world where the rate is not declining. There are still many countries where the rate is greater than the 2.1 children per woman needed to just hold the population constant. Soon after 2100 population will begin to decline everywhere across the world. In many countries population decline is already well established. Population decline is compounded by increasing longevity and a decline in the ratio of working population to aged population. Declining (and ageing) populations threaten the start of a downward death spiral of economic decline. The point is that this decline is inevitable. Demographic trends cannot be denied over a matter of 2 or 3 generations. Hopefully the decline will be slow and allow time for corrective actions – provided however that irreversible economic decline does not set in. The critical parameter will be whether total GDP can be maintained at a level to allow the per capita GDP to be increased or, at least, maintained in spite of a declining labour force. For the past 500 years (perhaps more), economic activity has been consumer driven and with a surplus of labour always available. Labour and its ready availability was in itself also the capital to be employed. Growth has been achieved by the increase of production exceeding the growth of population. Agricultural production before the industrial age was primarily a function of the labour available. With the advent of the industrial age, the link between labour force and production remained strong but industrialisation allowed an enormous productivity increase. It is the introduction of industrialisation into agricultural production which has also allowed the rapidly increasing population to be fed. However the last 6 or 7 decades has seen the industrial age morph into the age of automation. Automation is now gathering pace. Growth is no longer as dependent upon the availability of labour as it was. With population declining it is likely that GDP will – in the long term – also decline. Production cannot happen without consumption. 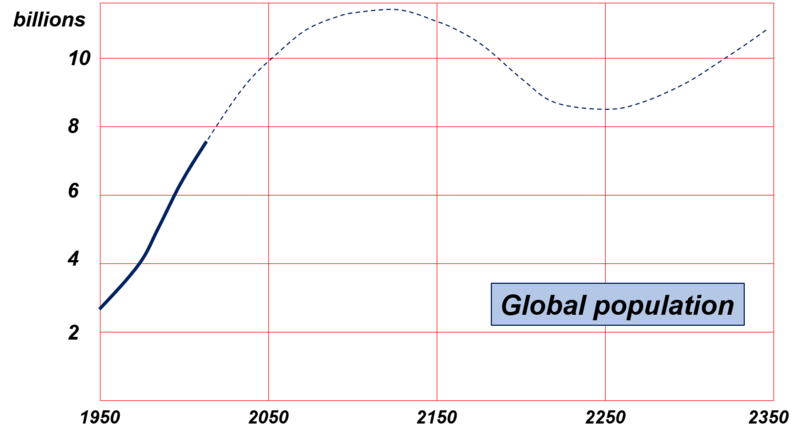 However ii is not necessary that the total GDP decline must exceed the decline of population. In the short term there may well be an increase of per capita consumption (and of per capita production). The question becomes how to maintain production with a decreasing work force available. But this is a question that all commercial enterprises face already. In the last 60 – 70 years, reducing work force and increasing automation has become a standard method of reducing cost and increasing productivity. Within two decades I expect that driver-less vehicles, pilot-less aircraft, army-less wars will be common place. Robot diagnosticians, AI assisted surgeons and teller-less banks are already here. Idiot-less politicians would be nice. The bottom line is that the paradigm that more employees means more production is broken. Automation has already progressed to the level where just the availability of a young work force is no longer a guarantee that production will (or can be made to) increase. The unemployment level of the less-educated youth of the world is testimony to that. Clearly if automation eliminates the need for human labour for all routine, repetitive tasks, then it also becomes necessary to occupy these young with years of further education. Together with a population living ever longer, the dependency ratio (ratio of non-working to working population) will obviously increase and increase sharply. For a government this can be a nightmare. Revenue generation is from the working population and large chunks of revenue consumption is for the education of the young and the care of the elderly. But that is also because tax revenues are so strongly dependent upon taxing the labour force. If the dependence of production upon the labour force is weakened (as it must be with increasing automation), and since production must eventually match consumption, then the entire taxation system must also tilt towards taxing consumption and away from taxing human labour for its efforts. (Taxing production is effectively also a tax on consumption because production which is not for consumption is not sustainable). Increasing automation also breaks the taxation paradigm. I can see population developing to “hunt” for a stable, sustainable level at perhaps around 9 – 10 billion with increases coming when new world are opened up to colonise. Pure speculation of course, but as valid as anything else. Population decline is not something to be afraid of. The next 100 years will be fascinating. This entry was posted on September 17, 2017 at 11:54 am and is filed under Demographics. You can follow any responses to this entry through the RSS 2.0 feed. Both comments and pings are currently closed.